My cousin Sheila and I met at a party, and it seemed like we’d known each other forever. Technically, we weren’t cousins yet, since she married into the Horn family years before I did. 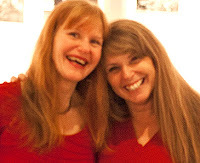 We shared thoughts on gardening, homesteading, and cooking. I was intrigued that she was fixing up an old farmhouse in Idaho, where she grew and preserved crops. We began emailing recipes to each other, and she sent me this gazpacho recipe back in 2002. 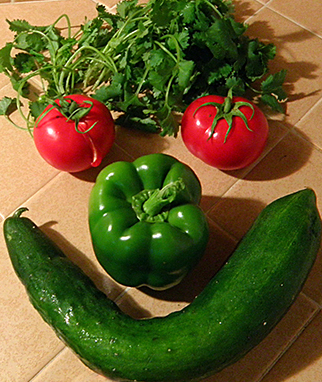 When I visited shortly thereafter, Sheila made us a garden-based dinner of vegetarian goodies. She assigned preparation of the gazpacho to my hubby’s sister and me, while she prepared more complicated dishes like chili relleno. 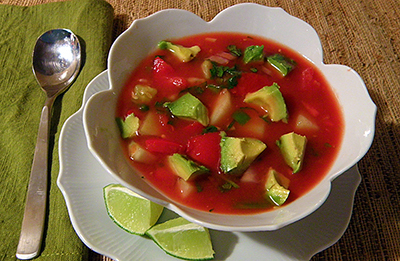 Gazpacho results were fresh and savory, even though Lisa and I forgot to add the salsa. Indeed, this recipe is quite flexible and forgiving. Measurements are approximate, and as Sheila says, “play with this recipe to your taste.” Or you can adjust it to what you have on hand. Based upon what was in my cupboard, I reduced the V8 juice amount by 1 cup, and substituted spicy tomato juice for half of it. You could choose plain tomato juice instead. I also reduced the quantity of salsa from 4 cups to 1. And since I had limes left over from salsa fresca, I added lime juice for extra zing. You could substitute lemon juice or white wine vinegar for similar effect. Sheila uses a dash of hot sauce, but the spicy tomato juice eliminated the need for it and then some. Enjoy some chilled garden gazpacho while it’s still warm out, as we smile in appreciation of 2013’s bountiful summertime weather and harvests. Let’s celebrate and take full advantage of summer’s grand finale of warmth now, as we head towards the equinox. Thank you, cuz, for the recipe! 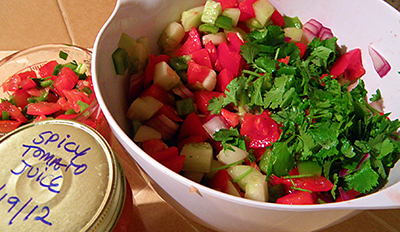 Combine tomatoes, cucumber, red onion, green pepper, jalapeno, and garlic in large bowl. Stir in salsa, V8 and spicy tomato juices, lime juice, chopped cilantro, salt, and pepper. Chill in the refrigerator until cold. Overnight chilling will allow veggies to take up more of the broth flavor. 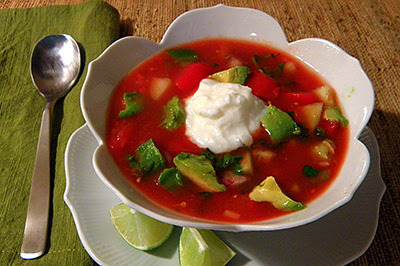 To serve, garnish each bowl with avocado, sour cream or yogurt, and lime slices.